Coverage: Listen live on BBC Radio Wales, online, tablets, mobiles and BBC Sport app. Johnny McNicholl says fellow Scarlets wing Steff Evans is the best in Wales and should play for Warren Gatland's side in the autumn internationals. 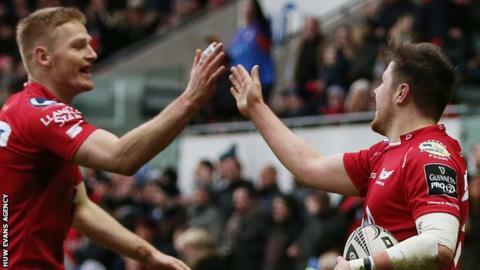 Evans was Scarlets' top try scorer as they won the 2016-17 Pro12 title and that form has continued in the revamped Pro14 with three tries in six games. "I'd put him straight into the starting line up and then the outside backs can fit around him," said McNicholl. "He's the one in form. I don't even think it's a risk to put him in there." McNicholl, who joined Scarlets from New Zealand side Crusaders in 2016, was coy about his own Test ambitions. He would qualify for Wales on residency under current World Rugby rules in late 2019. He said: "To be honest you'd have to ask me in two years time. Right now I'm happy just playing for the Scarlets and that's what I want to do at the moment. "When the time comes I'll be 28/29. Not having been in the country a year yet, am I Welsh? Not at all. "In three years time will I feel like I deserve to play for their team, their country? Who knows." McNicholl and the Scarlets' attention now turns to the European Champions Cup and a trip to Toulon on Sunday, followed by a tough home game against Bath five days later. That short turnaround has left head coach Wayne Pivac frustrated as he tries to manage his squad while juggling injuries, a situation that he unsuccessfully attempted to address with tournament organisers. "We certainly asked the question and we asked around the HIAs (Head Injury Assessments)," said Pivac. "At five days anyone who gets a bump is automatically out regardless, so we felt with us having a five-day turnaround and Bath having a six-day turnaround, maybe that wasn't a level playing field so we certainly asked the question: Could that be revised?" Tournament organisers European Professional Club Rugby (EPCR) said they "look to avoid" such issues but it was "not always possible". "This is a situation that EPCR looks to avoid but when venue availability, domestic calendars and broadcast schedules for the entire season are taken into account, it is not always possible. "In this instance, Scarlets asked for a change after the confirmation of the fixtures but it was not possible to accommodate a change of their Round 2 fixture." It wasn't and the Scarlets travel to France without Scotland back-rower John Barclay who is undergoing HIA protocols while Wales prop Rob Evans is set to miss the trip for the same reason. Pivac is hopeful former Toulon full-back Leigh Halfpenny will be fit to face his former side after pulling out of the win against the Ospreys with a slight hamstring injury. However, Pivac is confident the team is in better shape this year after losing 31-20 out in Toulon in the same competition in December 2016. "As a team we're obviously in better shape in every area," said Pivac. "We're missing a lot of players that were there last year that are big match players for us - James Davies, John Barclay and Rob Evans. "But we think the depth has improved so will be going there with one thing in mind and that is to get as many points out of that game as possible."